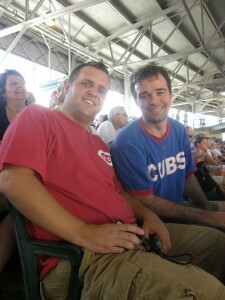 Ballparksavvy.com Visits Wrigley: Reds at Cubs | Have Game? Will Travel! Last year, on July 7, I watched Paul Konerko hit three home runs in the same game and realized that he was the first player I saw achieve the feat in six years. Now, this season, I have witnessed two players hit three home runs in one game. First, was Albert Pujols on May 30th. Today, assisted by a 20-mph wind blowing out of the ballpark, Drew Stubbs hit three home runs as the Reds hit seven home runs total (and four in the seventh inning) crushing the Cubs 14-3. The last time the Cubs gave up four home runs in an inning was May 7, 2008 and the last time they gave up seven home runs in a game was July 10, 2008 – ironically both versus Cincinnati. I sold my tickets to a friend before the game so I needed to buy a ticket. For some reason every scalper wanted $20 for their tickets. I could not negotiate a lower price. Finally, I bought a Terrace Reserved Infield for $20 from Broker Ben. Face value on the ticket was $35.84. However, I realized I made a mistake since I had no plans to sit in my purchased seat as Jake Cain from ballparksavvy.com was making a visit to Wrigley Field. Jake and his father were on a five-stadium in as many days tour and his review can be found here. Had I wised up sooner, I would have bought a SRO ticket from the box office and sat with Jake like I did anyway.